As a political appointee, van der Vaart's salary was supposed to end at midnight December 31, and he knew it. Everyone knows how that works. So what did van der Vaart do (with no doubt "a cost-benefit approach")? He signed an order (there must be official paper on this somewhere) demoting himself back down to a lower managerial slot in the Air Quality branch, a job level not subject to political appointment or firing. He made it impossible to get rid of him in North Carolina environmental management. Doesn't mean he has to be given any responsibilities. He needs to be shut out or he'll be a conduit back to Berger and his cronies. 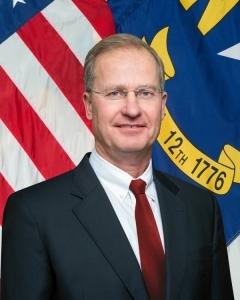 Over the past four years, Cooper's predecessor, a former Duke Energy executive, undermined efforts to combat pollution and environmental degradation. After his former company's coal ash spilled into the Dan River in February 2014, McCrory's regulators took two and a half years to settle on a paltry $6 million fine for what the Southern Environmental Law Center called "thousands of obvious violations of law." Another fine against Duke Energy over groundwater contamination at a plant in Wilmington was reduced from $25.1 million to $7 million in 2015. Then, after state toxicologist Ken Rudo testified in a deposition that the administration deliberately misled people who live near coal ash ponds about the quality of their drinking water, the administration embarked on a smear campaign against Rudo that resulted in the resignation of state epidemiologist Megan Davies, who said in a resignation letter that she couldn't "work for a Department and an Administration that deliberately misleads the public."